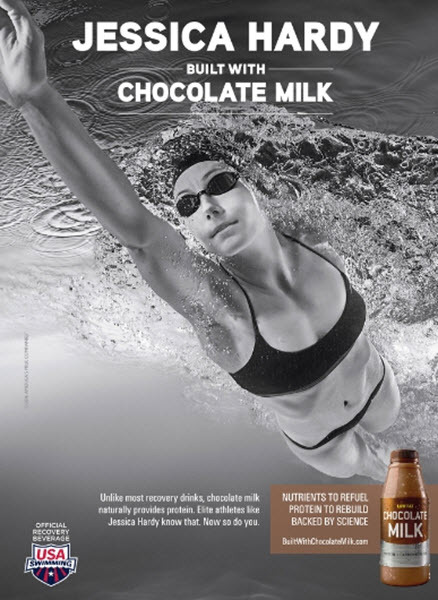 USA swimming athletes Jessica Hardy and Tyler Clary star in a new campaign for chocolate milk. 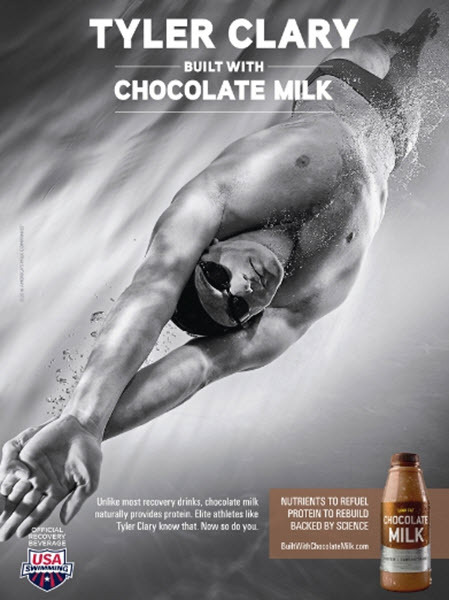 The swimming medalists are pictured swimming in the print ads. The campaign is to promote the post-exercise recovery benefits of chocolate milk. The campaign called "Built with Chocolate Milk" will also include a 30-second TV spot. It captures the athletes swimming as they would in competition. Tyler Clary says in a statement, "My training isn't complete when I get out of the pool - recovery is an essential part of every workout. For years, chocolate milk has been my first choice for recovery. It tastes great after my grueling workouts and it has a carbohydrate to protein ratio to help the body recover and basically rebuild after a really hard session." Jessica Hardy says, "I've been drinking chocolate milk after every practice and race for as long as I can remember. It's the thing I look forward to most. I believe that the protein and nutrients in chocolate milk have helped boost my recovery and contributed to my success as an athlete, plus it's a 'real food' and it's delicious."